He’s a real loose canon – Grammargeddon! An email last week reminded me of this particular bit of Homophone Hell: canon and cannon. Likewise, if you talk about Star Wars canon or Star Trek canon or Whovian canon, you want the one-n spelling. You’re talking about the corpus of information that’s accepted to be the basis of those shows, the core, the “rules” if you will. “That fanfic isn’t canon, and I won’t read it.” It’s not cannon, either, but that’s beside the point. I suppose it could become ammunition . . . naah. And of course, there really is a Loose Canon. Here’s a picture of it. 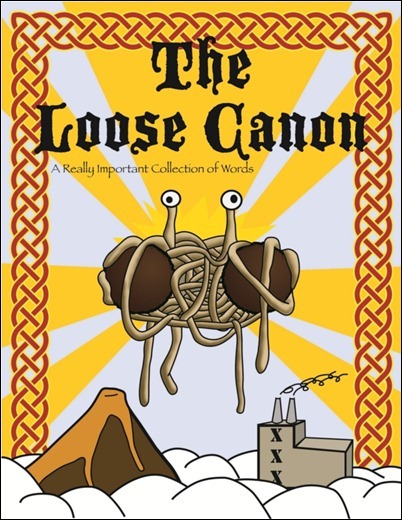 You can get it for yourself over at the Church of the Flying Spaghetti Monster. An actual Loose Canon with copyright and everything!